I live in Madison. I make music as often as I can. (“Have bass; will travel,” reads my imaginary calling card.) Madison may appear to have a very active live music scene, but it also enough supply of musicians to strain demand. Only the best are likely to find steady work close to home. The aspirants and journeymen among us must travel if we want to keep our calendars full. So when I got a call to play a graduation party at a home somewhere between Argyle and Darlington I said, “Sure.” An online, satellite-assisted mapping service that shall remain unnamed told me that the shortest possible route from my address to the destination would take one and a half-ish hours. A slightly longer route followed four lanes of cruise-controlled motoring down Hwy 151 for a good part of the way, while the slightly quicker route was all byways and back roads. It was a choice between scenery or seen-that, between boredom or adventure. The weather helped me decide. A glorious, partially overcast day in late May. I went for minimum miles and maximum meandering. Wisconsin may have no mountains to speak of, but it does have highs and lows and plenty of geographic and geologic variety. The southwest corner of the state, into the heart of which I was venturing, is a landscape of farms spread over and around rolling hills and dales that deepen as streams pick up steam on their way toward rivers that feed the Mississippi. The road system can feel antiquated as it bumps and bends sharply around old properties, or climbs up or cuts through rocky hilltops. And the naming of county roads can turn especially confusing when traversing multiple counties. But before getting into the part of the state that geologists define as The Driftless Area, I have to get out of the greater Madison area. Heading southwest from the northeast side of town leaves no quick and easy solution to the obstacle of urban Madison. With a mid-afternoon departure on a Saturday, rush hour traffic was not an issue, so I chose to embrace downtown traffic and exit the city following a crow’s flight path as closely as possible: Sherman to Gorham to Randall to Monroe to Nakoma to Midvale to Verona Road, aka South 151. The isthmus route. 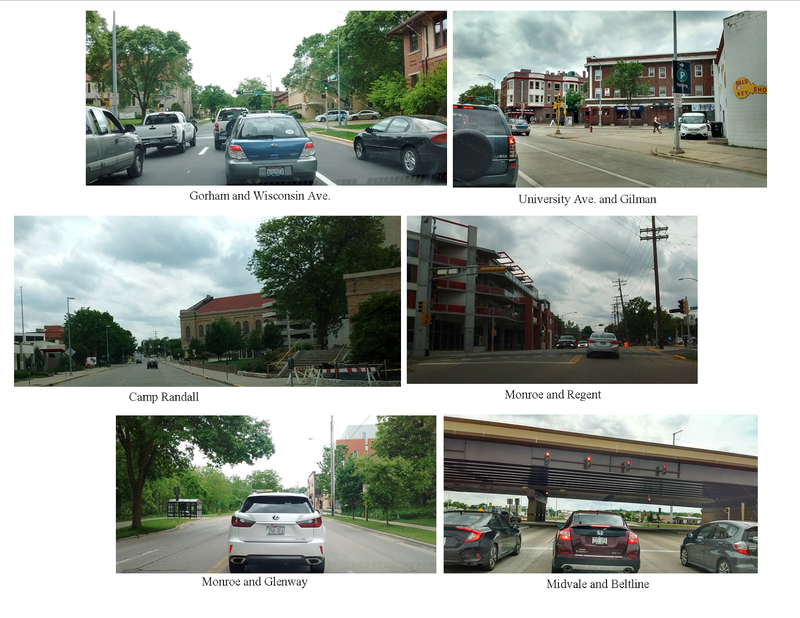 Through downtown, crossing State Street, through campus, passing Camp Randall, and through the near west side. 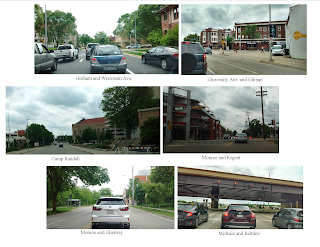 Slipping under the Beltline and on to Verona Road says goodbye to residential Madison and hello to traffic and road construction and frontage road environment. Past PD/ McKee Road, highway 151 is freed of traffic lights until you hit Dubuque. 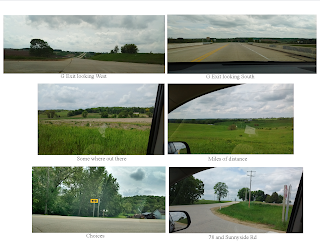 The four lanes of 151 loop underneath and around Verona in a fat U shape, and just after it turns west again, and at the top of a long incline, I take the exit for County road G.
Now I am officially heading into the great Wisconsin southwest. G goes along the top of a broad ridge toward the town of Mount Vernon. There the road jogs while joining highway 92, then leaves, resuming a SW direction. So far, so good. We know that we want to eventually get on to County A, but the Green County A, not the Dane County A. Same name, different roads. G and A (Dane County) conjoin for a few miles and then split, at which point we want to turn west on to a jog on A and/or JG, but then a quick turn south on JG. At this point, the unnamed online, satellite-assisted mapping service is unclear. (Some details must be beneath the attention or beyond the abilities of the minions of the satellite overlords). County JG soon crosses the Green County line, at which point it becomes just J. Okay? We will leave J to turn right onto A (not the Dane County A, obviously) and let it wind us down to Hwy 78, where we will turn left (South) and soon enter Argyle where we will cross the Pecatonica River. That was the plan, but not exactly what happened. It’s what I wanted to do, but it can’t be what I did because I turned onto Hwy 78 somewhere north of Blanchardville, right near the corners of Dane, Green, Layfayette, and Iowa counties. Where did I go wrong? At some point a kernel of doubt, a sinking feeling of something having gone amiss took hold. The seemingly innocuous hills and dales, revealing one rural glory after another, the road demanding attention with blind turns into old cuts cut into weathered granite upheavals falling away and descending into lanes lined with plantations of towering pines protecting a well-tended farmstead, etc. etc.—all combined into tremors shaking confidence in my innate sense of direction. My vehicle is equipped with one of those handy little compass indicators in the rear-view mirror. I had been paying it no mind, but now I did. It said NW. Huh? Wasn’t I supposed to going SW? I kept checking but the best the compass would give me was W. But it’s okay, I said. No need to panic. I followed my nose and found my way to Hwy 78. It wasn’t until the next morning, pulling out my trusty Wisconsin Gazetteer, that I was able retrace my missteps. Not far past the turn onto A (Green County) is an even fork in the road, and, yes, I took the one less traveled. I took the right fork, but A was the left. Now I was on the not-very-clearly-marked Badger Road, which quickly turned to the NW. It was here that I sensed something was not right, but not so strongly as to immediately turn around. Before long the wrong road ended at another poorly marked intersection (York Center Road, we know now) where I determined that a left was the only logical turn to take. (And what a lovely little valley it took me down.) This road stopped at Hay Hollow Road. This time my directional instincts told me to turn right, onto what road I knew not, but sticking with it (it turns out to have been the cheerily named Sunnyside Road) and after crossing a barely noticeable Sawmill Creek, I climbed out of the bottom lands and eventually mounted a ridge where the much sought after Highway 78 was at last found.